Royal Doulton’s rise from London makers of domestic stonewares to an internationally-recognised Staffordshire Potteries brand, could scarcely have been predicted in 1877 when the Lambeth concern arrived in Burslem. "In their view, we Londoners know little about God, and nothing about pottery". Royal Doulton's rise from London makers of domestic stonewares to an internationally-recognised Staffordshire Potteries brand, could scarcely have been predicted in 1877 when the Lambeth concern arrived in Burslem and Henry Doulton made his often-quoted remark. 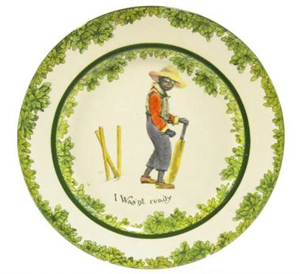 That it happened owes much to the birth of its two most enduring lines - the character figure and the character jug - and the impetus they gave to these great traditions of Staffordshire pottery. The key figure in the story of Doulton's 'Burslem' studio is Charles Noke. He had spent 15 years at the Royal Worcester factory before he became chief modeller at Doulton in 1889 where he remained the dominant creative force for half a century. 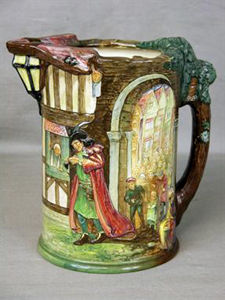 Until his death in 1941 (one of his last models was a character jug of Winston Churchill) he oversaw many of the factory's most popular 20th century lines including the rich brown glazed Kingsware, the practical and decorative Series Ware and the range of loving cups and jugs modelled with scenes from British literature and history. Noke showed the first Doulton figures (the so-called Vellum collection) at the Chicago Exhibition in 1893 and 20 years later was responsible for launching a designated range of figure models - known as the HN (Harry Nixon) collection - while the first character jugs,John Barleycorn, Old Charley and the double-faced Mephistopheles, arrived in 1934. Although made across a century in a bewildering variety of subjects, styles and colours, Doulton figures and 'tobys' are instantly recognised and widely collected around the English-speaking world. Figures may represent only one small part of Royal Doulton's output but the HN series range, which began in 1913 with 20 figures (HN1 was the Charles Vyse figure of a small boy in a nightshirt that Queen Mary christened Darling),now numbers in the thousands. New figures are still being designed today. Most HN series figures remain very affordable. This version of the classic Leslie Harridine figure ‘Top O’ the Hill’ sold for £20 at Nicholsons, Fernhurst in May 2010. The inspiration for the collection has been extraordinarily diverse - child studies, fashionable ladies, occupations, nationalities, historical figures, literature et al - and, across a century of production, has embraced the full range of predominant decorative styles. Some of the early modellers were well known sculptors in their own right - including Pheobe Stabler and Charles Vyse - while other names such as Arthur 'Leslie' Harradine and Margaret May 'Peggy' Davies are simply synonymous with Royal Doulton. As a general rule, the most desirable figures come from the first half of the 20th century. Exact production figures are not available but it has been said that even a popular pre-War figure would have been made in much smaller quantities than a modern edition - even a modern limited edition. Some of the less popular pre-War models were withdrawn from production in the mid 1930s, others in 1938, while the outbreak of the Second World War and the restrictions that it brought caused the deletion from the range of the majority of the existing figures. 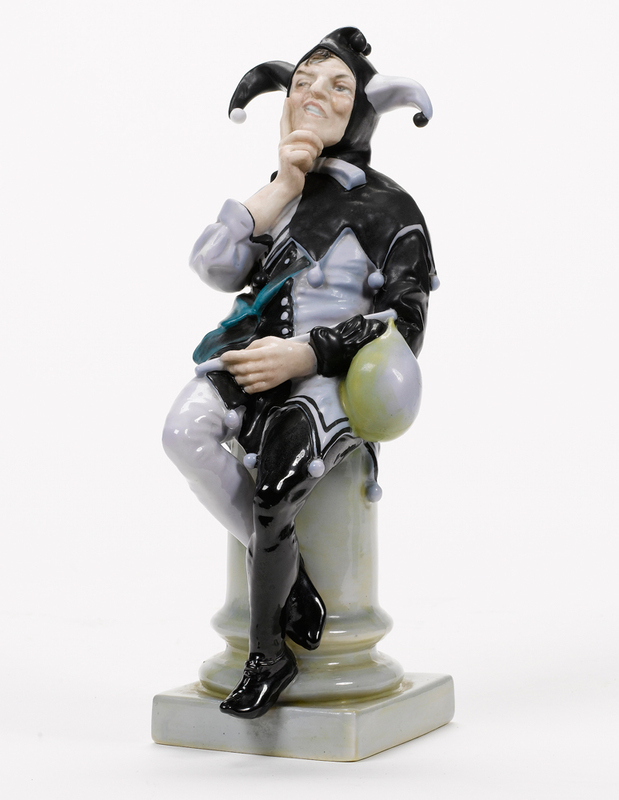 Today, some figures are extremely hard to find in any form while others, such as Noke's classic model The Jester, were produced in unusual colourways (the term used to describe the different combinations of colours used to decorate a figure) or were available with special glazes. However, while there are collectors who, for example, focus only on Art Deco (and sometimes risqué) bathing beauties designed by Leslie Harradine in the 1920s and '30s, it does not necessarily follow in a collecting hierarchy based on rarity that the older the figure the more desirable it will be. Such was the success of the aforementioned Darling that it is still in production today (only the very early issues command substantial sums) while other classics such as Top O' the Hill or The Balloon Seller proved equally enduring and aren't too difficult to find. Often it is the most popular Doulton designs, those that remained in production for many years, which can be bought most cheaply. Conversely, the more recent designs can become rare when the edition size does not meet collector demand. These include commercial failures, trial colourways, prototypes, figures with subtle modelling variations or those produced in small 'made-to-be-collected' editions. In determining the rarity from the run-of-the-mill, the collecting literature or online resources are essential starting points. It took Charles Noke almost ten years to be satisfied with the standard of design and production, but in 1934 the first Doulton character jug was launched. 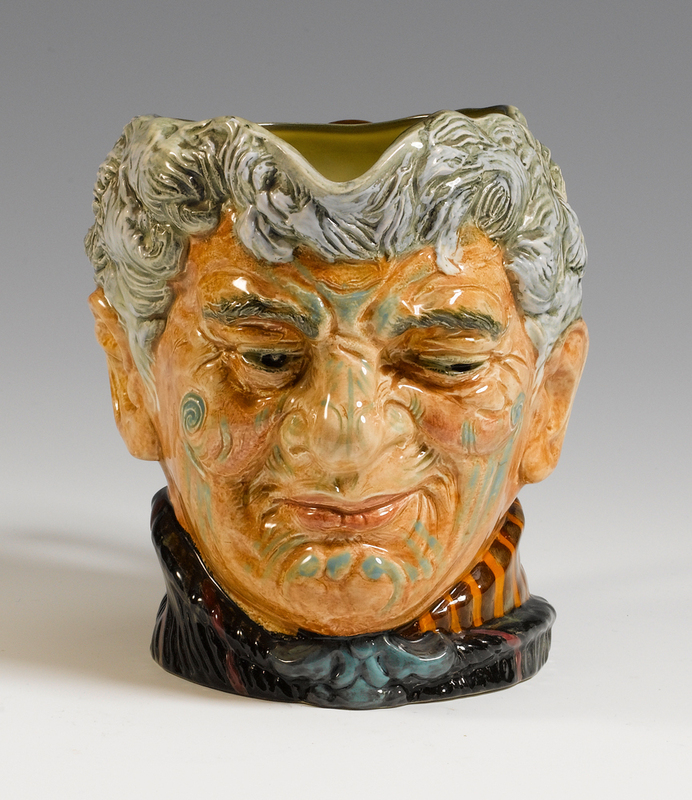 A novel spin on the traditional 18th and 19th century toby jug, only the head and shoulders rather than the full body length provided the 'canvas', while the handle was modelled to relate directly to the subject. Such jugs were made in up to three sizes - miniature, small and large - and across eight decades of production have embraced subjects as diverse as Henry VIII and Garfield the Cat. They are still made today. Rarities have occurred throughout the history of Doulton jugs due to colour and modelling variations and limited production periods. 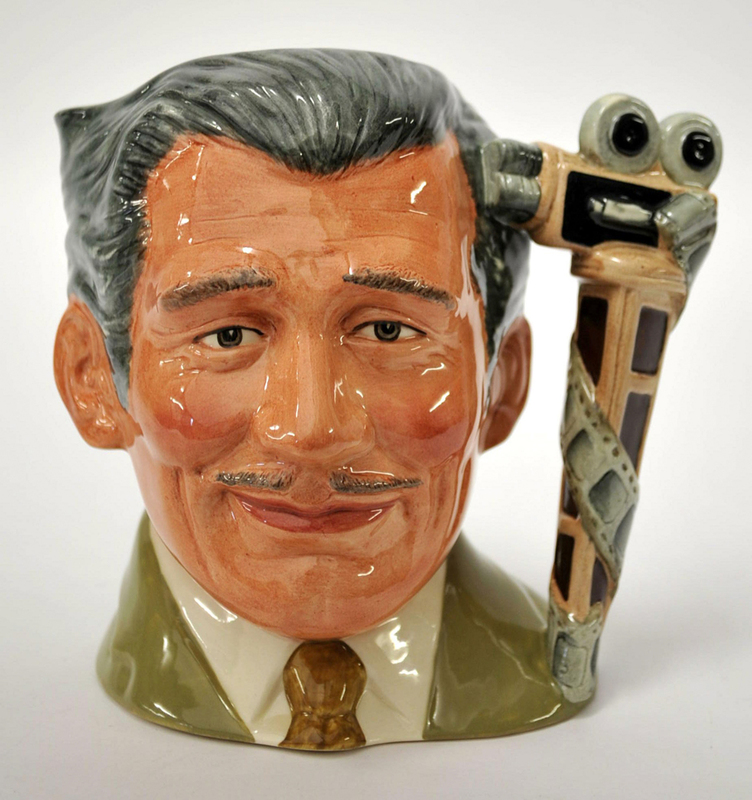 Some were expensive mistakes (in 1984 the Clark Gable character jug was withdrawn following contractual difficulties with the actor's estate). 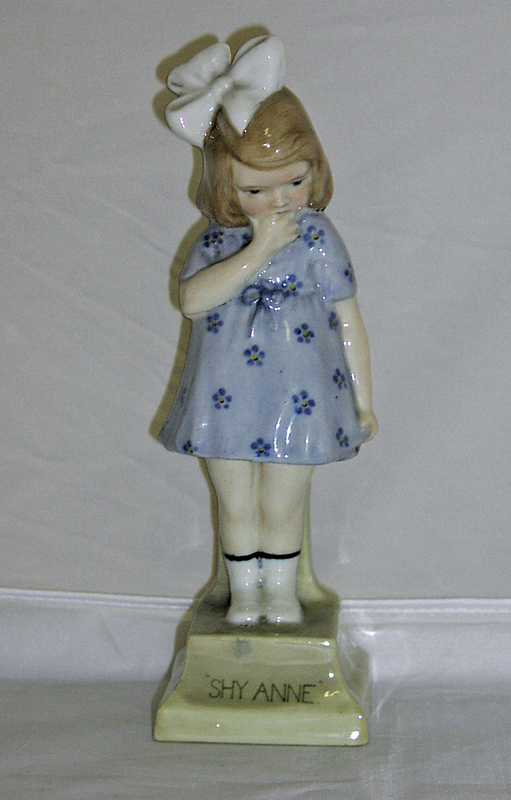 Some were the result of poor sales or austerity (in 1947 the chirpy cockney known to collectors as Pearly Boy was remodelled to reduce production costs in the post-War climate). Some were simply pre-production models and prototypes while others were made in limited numbers to excite the collecting market. Occasionally it is only the size of the jug that is unusual or indeed the backstamp. 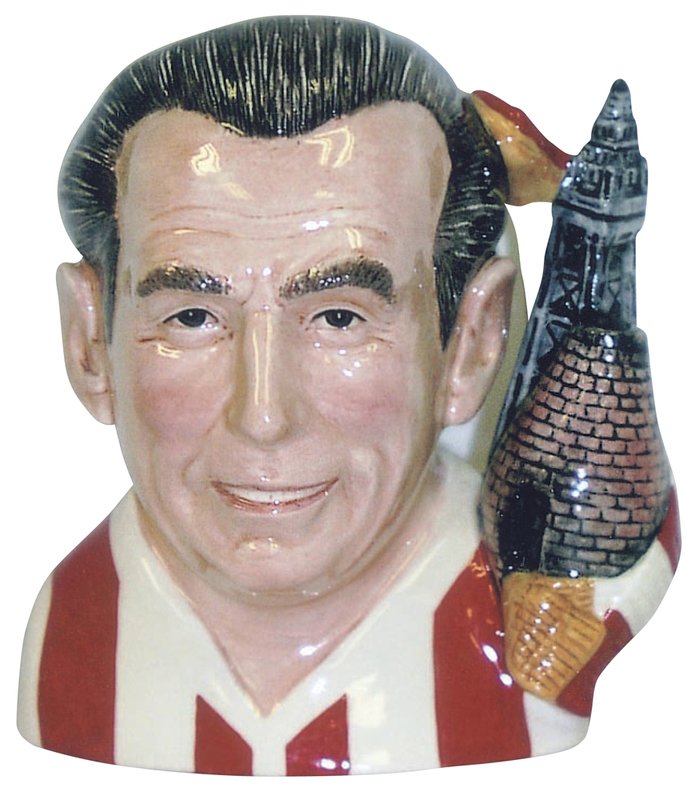 Two of the most expensive jugs ever sold at auction were produced in editions of only three: the model of Toby Gillette, the boy whose face was modelled in clay for an episode of Jim'll Fix It, and that of the Staffordshire football legend Sir Stanley Matthews wearing Stoke (rather than England) colours. Although surprisingly few collectors buy both figures and character jugs, these two markets behave in much the same way. All Royal Doulton lines offer purchasing opportunities right across the price spectrum from £5 to £15,000. The great majority of character jugs (regardless of size) and HN series figures were mass produced and are worth under £100 - and most of them less than £30 each when sold without reserve at auction. Much the same can be said for related lines such as the limited edition, relief-moulded loving cups and jugs, as well as the many different printed designs of the Series wares made using the 'print and tint' technique where prices begin at just £10 (a key reference here is the five small volumes on the subject by Louise Irvine). For casual collectors who buy Doulton simply on the strength of subject matter or personal preferences, this is a buyer's market in need of new entry-level collectors. 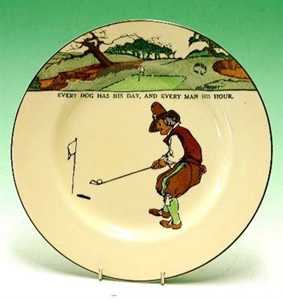 Online trading, and eBay in particular, has proved well-suited to Royal Doulton but it has brought a glut of examples to light - too many for even the large number of collectors in the UK, the US, Canada, Australia, New Zealand and South Africa to absorb. But rarities, those that plug holes in the collections of the top tier of Doulton collectors, are a different matter. Here high three- and four-figure prices are the norm with a clutch of hard-to-find early figures capable of selling at over £5000. Prices were higher still in the 1980s and 1990s but the absence of a handful of major collectors, and an unusually healthy supply (partly occasioned by the controversial sale of much of the Royal Doulton archives), have seen levels fall somewhat. 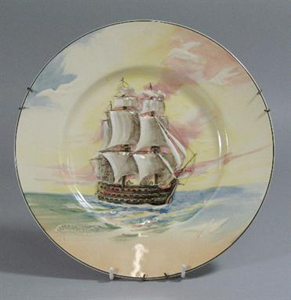 In pursuit of the rarest Doulton productions, damage can often prove little deterrent. 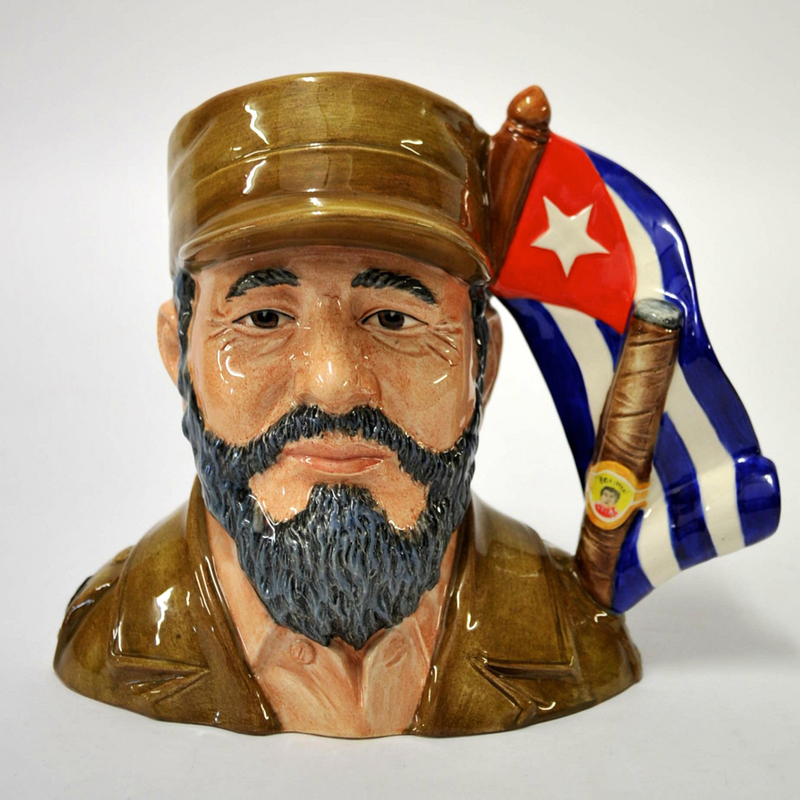 In keeping with many areas of the collectables ceramics market, buyers can insist on perfect condition for relatively common models but breaks and restoration are tolerated if no perfect version is available. Another feature of the market in recent years has been the added interest in the experimental glazes that characterised much of the factory's more avant-garde, turn-of-the-century wares. These include the so-called Vellum finish seen to the earliest figures made before the advent of the HN series but also glazes in imitation of Chinese wares such as Titanian, Sung, Jade, Flambé and a straightforward lustre. Typically these will command a premium. 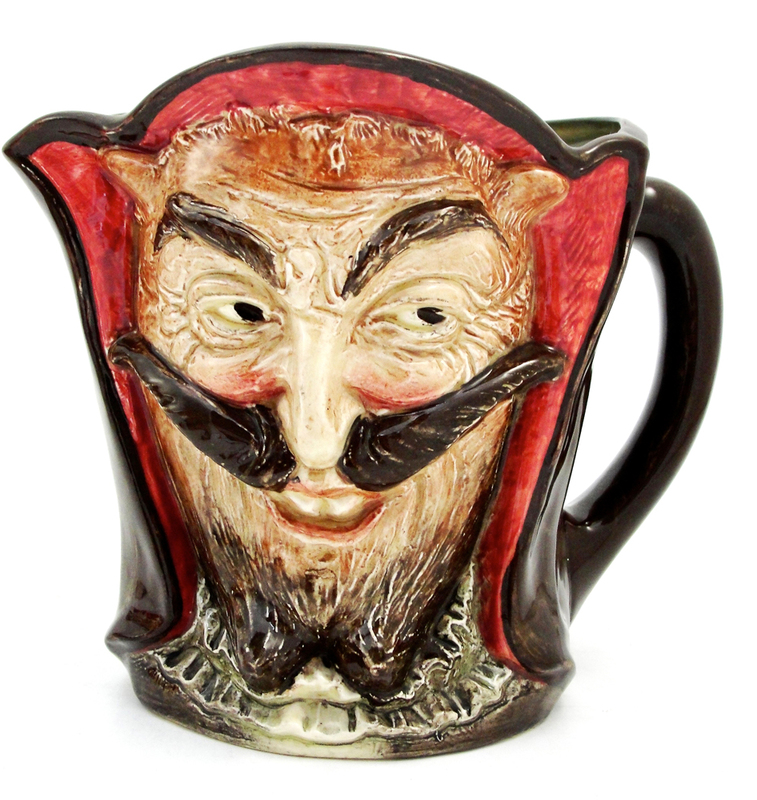 Prices for some of the scarcest character jugs have undoubtedly softened since the 1980s. A fabled rarity such as The Hatless Drake (it has the words Drake he was a Devon man printed in relief across the subject's shoulders) might have cost £3000 three decades ago. Today something around half that would be expected at auction. The Maori jug (one of only half a dozen 'pilots' made in 1939) sold for £19,000 at Phillips in 1998 but took £11,500 at Bonhams in 2008. However, Doulton tobys continue to interest a substantial collecting base and a clutch of dealers such as UK International Ceramics of Woodbridge, Suffolk and the Florida-based traders Pascoe & Co and Aaron Rimpley who are active participants in major sales. Some of the most valuable jugs on the market in recent times have been those made relatively recently in small editions or as factory prototypes. The response to these can be unpredictable (subject matter counts and some jugs are deemed more successful than others) but when Bonhams sold a large group of factory trial pieces from the Doulton archive in March 2008, some impressive sums (£1400-£7000) were achieved, partly thanks to some strong bidding from the Toby Jug Museum in Evanston, Illinois. There is less enthusiasm for jugs made in 'limited editions' of 1000 or more. Generally speaking, the larger the edition, the cheaper the jug. 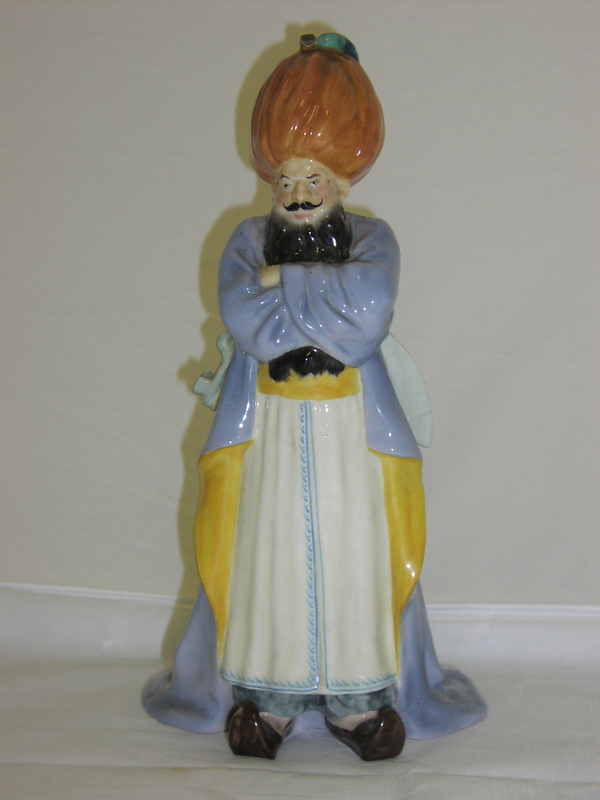 A Century of Royal Doulton Character and Toby Jugs by Stephen M. Mullins, David C. Fastenau, Louise Irvine. ISBN-10: 0764329731. The Charlton Standard Catalogue of Royal Doulton Beswick Jugs by Louise Irvine, ISBN 088968166X. Royal Doulton Series Ware by Louise Irvine, ISBN 0317550373.